- you need make-up or face paint. 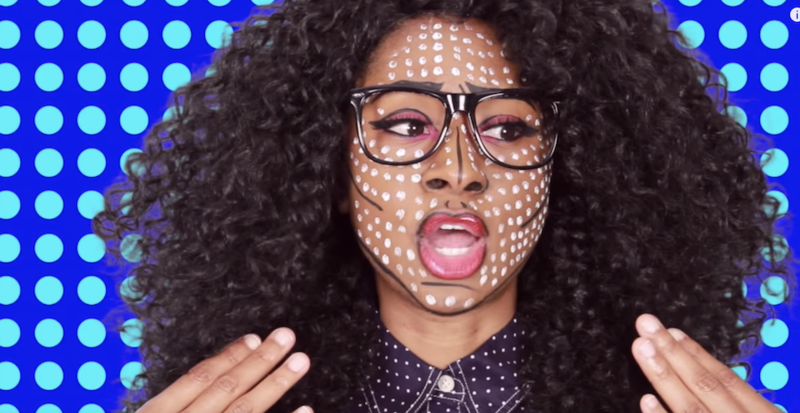 Become pop art by dotting colour around your face - it really is that simple! If you've got a brightly coloured wig to hand, then this can jazz your whole outfit up. - you need scissors, string, pens & cardboard. It's up to you how much effort you put in with this costume, but at the very least make yourself a nice big tag saying "To: Women, From: God." If you have a big cardboard box hanging around, wrap some wrapping paper around and wear it too. This is an easy costume to knock up if you've left it to the last minute. - you need scissors, cardboard, duct tape, a pencil and some fabric. This one may look impressive, but it's actually surprisingly easy! 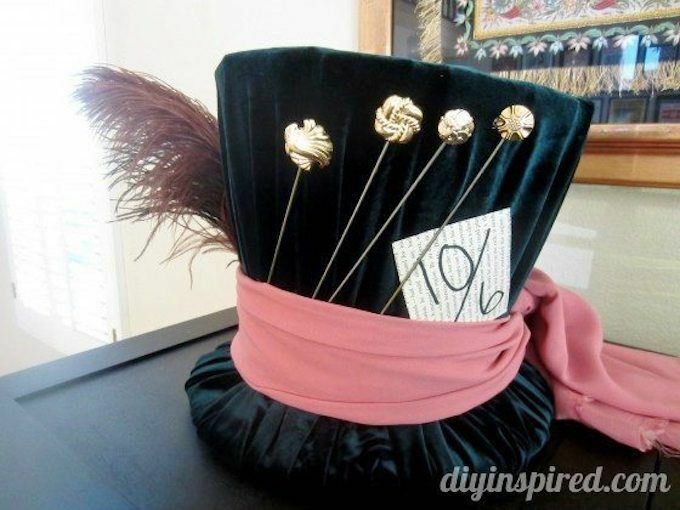 Make a Mad Hatter's Hat out of cardboard following the instructions at diyInspired. You don't need much else to complete this last-minute Hallowen costume - a bright scarf tied in a bow around your neck, a jacket, and you'll be unmistakable. 4. Noel Edmonds "Deal or No Deal"
- you need a large cardboard box, glue, scissors, string, paint & paper. Love Deal Or No Deal? Print out a Noel Edmond's face and attach it to some cardboard. Poke two holes in either side, then use some string to create a mask. Paint your cardboard box bright red and print out any number from 1 - 22. Attach strings on either side, so you can wear the box hanging from your shoulders. Wear a Noel Edmonds style shirt and your costume is complete. - you need cardboard, string paints & pens. 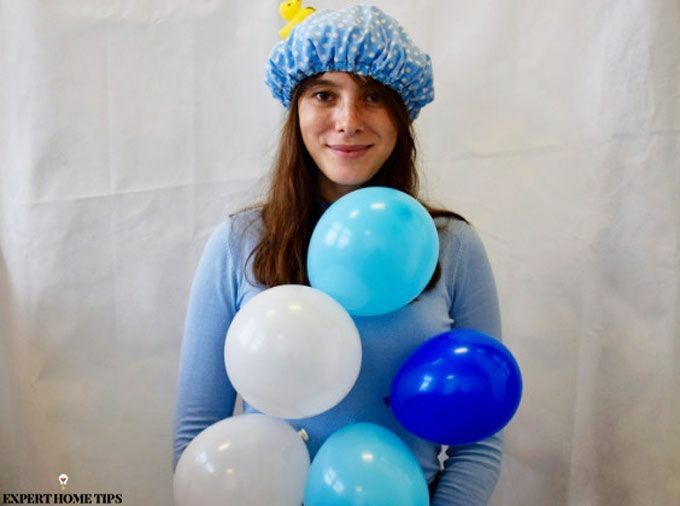 This is a super-easy costume idea, all you need is a bit of imagination! Cut out a cardboard dress with the sticky tabs on the outside and tie it around yourself with a string. - you need plastic toy snakes or pipe cleaners. With a flowy white dress and some plastic snakes in your hair, you can quickly become Medusa, or if you can't find any, shape some pipe cleaners into snakes instead. Add some purple makeup, and you're all set - spooky! - you need cardboard, paint & a brave belly. Love avocado? Prove it! 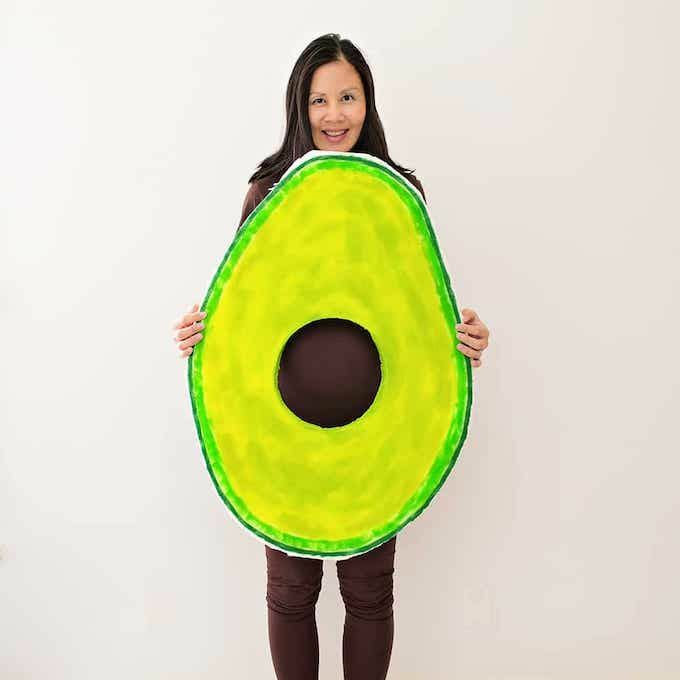 Using a large piece of cardboard, cut out an avocado shape and cut holes for your face and your belly. This one's particularly practical if you're currently pregnant - it'll make the perfect stone! Want to full tutorial? Head over to Hello Wonderful. - you need balloons, rubber duck, headband & a white outfit. This is a brilliant and easy costume for children and adults alike. Make your own DIY Bubble Bath Halloween costume by following the instructions at gigglesGalore.net. - you need a pen, or a cardboard of a profile page. Be a Facebook profile page! Print out, or draw your (or someone else's) Facebook page and stick your face through the profile picture hole. If you don't want to go to all that trouble, just write 'BOOK' on your face a la Jim from The American Office. If you really don't want to put much effort in, this is the one for you. - you need face paint & a pair of fishnet tights. This is a great base idea for a snake, fish or anything you can think of that has scaly skin! Using a pair of fishnet tights and some face paint, you can create an amazing effect on your skin. Use metallics for best effects! - you need paint colour charts. The prize for the least effort will go to this costume. Head to your local paint shop or DIY store to pick up grey paint colour swatches and pin them to yourself. See if anyone gets it. - you need scissors, an old white t-shirt, paints & cardboard. Paint coloured circles onto an old t-shirt, just how they are displayed on a Twister mat. 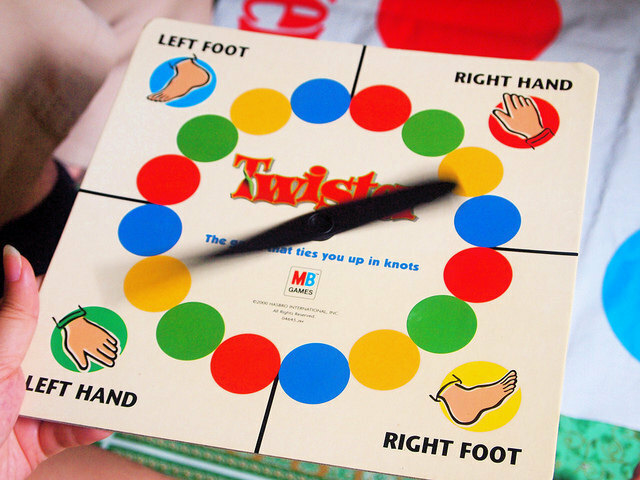 Cut out a square of cardboard and draw a Twister board on the front to carry with you. Easy! For even more fun, take the actual game with you. - you need scissors, cardboard & a printer. If you're into the Sims then this is the perfect last-minute costume for you. Print out a copy of the Sim diamond shape and attach it to the top of your head using an old headband. If you fancy making a bit more effort, print out different colours and stick to a board to create the pixel effect when the characters have no clothes on! - you need a Sombrero (or umbrella), quilting, a hot glue gun, fabric, ribbons and yarn. 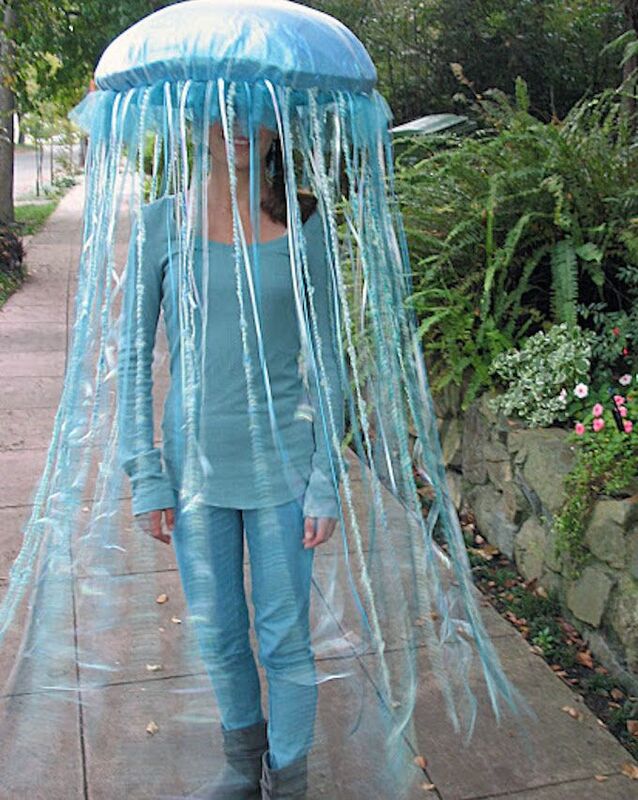 For something really creative but surprisingly quick and easy to do, opt for a jellyfish costume - Home Arts With Angela can show you how. If you're struggling for supplies, head to the market where you're sure to be able to find some offcuts of fabric for a bargain price. - you need scissors & cardboard. Hoping to get lucky this Halloween? A mega-easy costume that anyone can do is bringing your Tinder profile to life! Grab some cardboard and cut out a heart and a cross, then stick it on yourself! If you want to, cut yourself out a white frame border for your face too. Hope you've got some good cheap Halloween costume ideas from our list! We'd love to hear about your ideas in the comments below too!